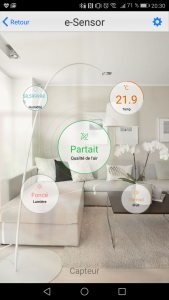 Still within the framework of the home automation installation of the house, I wanted to combine several sensors (air quality, temperature, humidity but also light quality) into a single element. Faced with this problem I had several solutions. The first thing I considered was setting up my own power plant based on ESP. It is a relatively easy solution to implement and, above all, very inexpensive. Except that in the meantime I discovered the broadlink product range and in particular their A1 sensor, which in addition to the specifications I asked for also proposed a control of the sound intensity (not useless to make lower the volume automatically of the television for example at a certain time of the day). The design was also quite pleasant here, the green one being particularly allied to the ambiance of my living room (more easy to pass on to my wife, than a prototyping card with an ESP plugged in to tear it off. I ordered it on gearbest for about 34 euros. It’s a little cheaper right now. For the packaging it is rather of quality, as for the sensor itself the plastic may be a little cheap but the assembly is of quality. The size of the sensor is smaller than what I expected (I hadn’t looked at the size specifications before buying it…), so it’s a good point because it can be very discreet. Installation is quite easy. 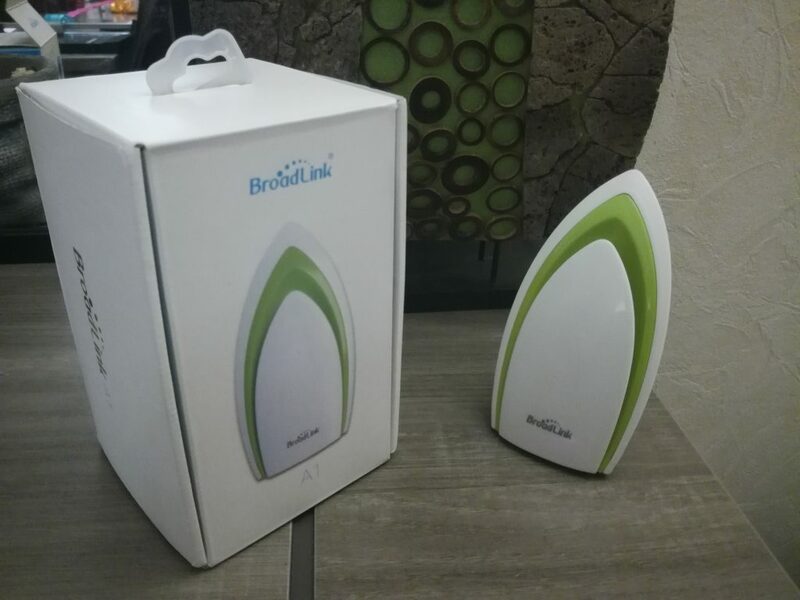 It is necessary to download the broadlink application beforehand, you have to connect the small sensor A1 to the micro USB port of the top present at the rear (in passing I don’t know what the other two ports are used for…). The application is started, the sensor reset is pressed and a new piece of equipment is added to the application. It will be detected quickly, we enter our wifi parameters and it’s over. At this moment it is possible to know the temperature, humidity etc… and use it to communicate with other equipment of the mark already registered on the application. 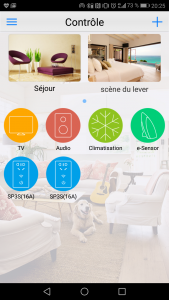 For example, start air conditioning with the RM mini 3 (in infrared) if the temperature is higher than X°C… But of course you have to buy other Broadlink brand equipment. Fortunately we can use the sensor on jeedom and this is where it becomes interesting. Broadlink has a plugin available on jeedom. To add equipment is very simple. It must first be installed via the application before an ip address can be assigned. Once it’s done, you have to retrieve this ip address. Through your freebox interface, or a third-party application, you are usually used to. Then we go to Jeedom / plugins we click on the green “plus”, we give it a name, and we give it the ip that we recovered previously. The commands can then be used to create scenarios. I’ll explain all this in a future article.